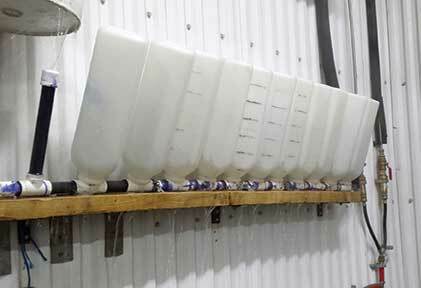 I was looking for a way to rinse calf bottles thoroughly and efficiently. I took 1-inch PVC pipe, 4 feet long, and connected it to the hot water line. Every 4 inches I attached a T with 1 foot of PVC pipe attached to that. Each pipe had a plug on the end, and I made a few holes on the sides and the top of the plugs so water can squirt out in every direction. After feeding calves, I put the milk bottles on each of the 1-foot pipes. I turn on the hose, and the bottles wash cleanly and conveniently.